Abubaker Kaki is making his Olympic debut for Sudan in Beijing, where he is a favorite to win gold in the men's 800m. Kaki is the latest middle-distance running sensation from Africa, and at just 19 years old the former soccer goalie could become one of the youngest Olympic track and field medalists since Bob Mathias won the decathlon in 1948 when he was 17 years, 263 days old. In March, Abubaker Kaki of Sudan became the youngest champion in the history of the World Indoor Championships. At just 18 years and 262 days old and competing in just his first season on the European track circuit, Kaki became the youngest indoor world champion in history in March when he won the men's 800m in 1 minute, 44.81 seconds. The time was just one tenth of a second off Joseph Mutua's African indoor record. Prior to his Worlds breakthrough in Valencia, Kaki flashed signs of his potential greatness. At the All-Africa Games in 2007, he won the 800m in 1:43.90, setting a new Sudanese national record. 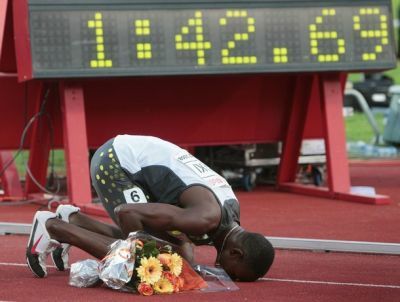 Kaki, who was a bronze medalist in the 1,500m at the 2005 World Youth Championships, continued his strong running early in 2008, winning the 1,000m at the GE Galan meet in Stockholm in a world-leading 2:15.70.